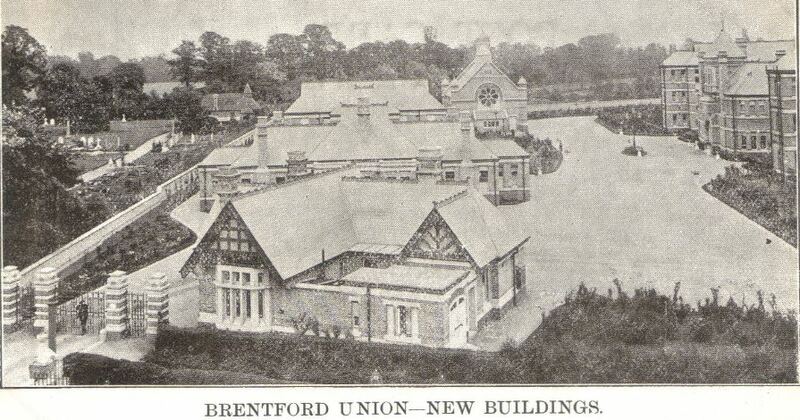 This slightly grainy postcard is from my collection and shows the new Brentford Union Buildings - more commonly called the workhouse. The card has not been used, but in the area marked for the 'Halfpenny Stamp' to be stuck someone has written Jan 25th (possibly 23rd or 28th) 1904: around two years after the new buildings opened. Peter Higginbotham has undertaken extensive research into workhouses and the workhouses.org.uk website has all you need to know about Brentford's workhouses (there was an earlier building). Comparing the image above with the plan on Peter's website, it is obvious the postcard shows just a quarter of the site. The building in the foreground is the Lodge, a man behind the wrought iron gates - presumably a warder not a resident (or inmate as they were generally referred to) - being the only sign of life. The building beyond the Lodge Peter has marked 'Receiving' and linked and behind it 'Remand Boys'. The rose window of the Chapel is visible towards the back of the site. Immediately to the right of the chapel is 'Female Aged' then the home of the 'Master' and at the centre edge a part of the 'Male Aged' building.